It is difficult to know the exact origin of the Basques. Different searches take us to mistery within the history of this people and his land. Today’s personality of the basques is the end of many centuries of vivid history. The first inhabitants of the Basque Country is in the Low Paleolitic, aproximately 200.000 years ago. The romans stayed in the Basque Country until the fall of the Imperium, although their pressence was not massive. After the romans, the basques dominated the territory, but always disputing with the people coming from Europe. The reign of Navarra was created to fight the expansion of French and musulmans. This reign extended from the Pirineos up to the south of the Basque Country, including continental Navarra (Nafarroa Beherea). Furthermore of political and militar fights, the Middle Age was full of activity in the Basque Country. After French Revolutin (1789), basques provinces were elliminated, and substituted by departments (90 in total). 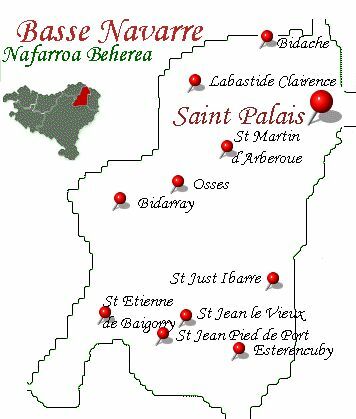 Since then, the three procinces that historically formed the Northern Basque Country (Lapurdi, Nafarroa Beherea and Zuberoa) are part –all together with Bearne– of department number 64 of France. During XIX century, the Carlistas Wars were hel in the Basque Country. After the Carlistas Wars, the Monarquy, the Republica and the Civil War came along. By 1981 the Basque Government was created, after Araba, Bizkaia and Gipuzkoa approved the Estatute of Autonomy of Gernika. Nafarroa has his own government and parlament. All the basques still maintain strong liaison with the Basque Country. 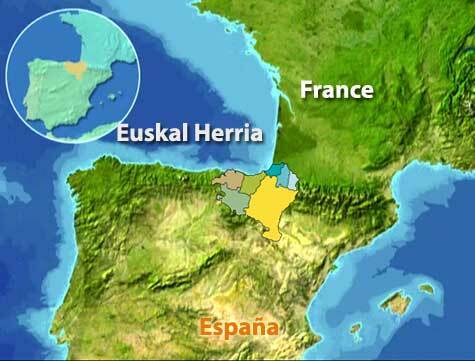 Euskal Herria, is part of France and Spain. In this map you can find the seven zones that it usually divides, four of then in Spain and three in France (in different tones of blue? Lapurdi, Behenafarroa and Zuberoa are the three states in the french territory, close to the Pyrenees. Although the had intents of independence during 1789, the basque provinces in France, together with Bearn and some other parts of Burdeos, became part of Low Pyrenees department, today Atlantic Pyrenees. The administrative basic unit in France is the “comuna”, and the equivalence in the basque territories is the major. The comunas are rurals when they are smaller than two thousand inhabitants, and urbans when they have a bigger number around the principal city. All the comunas together become the “canton”, similar to “comarca” or “region” in the spanish side. All the comunas together are the Department, and they are similar to the peninsular provinces. The territories of Lapurdi, Behenafarroa and Zuberoa have no oficial administration at all. 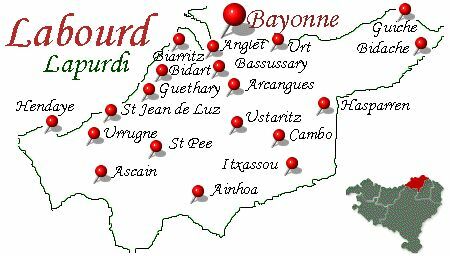 All the economic and administrative activity in Lapurdi, is based in Bayona, as a sub-center of Burdeos. Lapurdi has 857 sq.km, and it limits with Adour River on the north, the Pyrenees on the south, the Cantabric Sea at west and a lign dividing the cantones of Sauvaterre, Navarrenx, Sainte-Marie d'Oloron and Aramitz. The landscape in Lapurdi is quiteful, with big land extensions and small acorn forest, as well as castaños and abedules. The rivers are short and they give the water to the Atlantic Ocean. 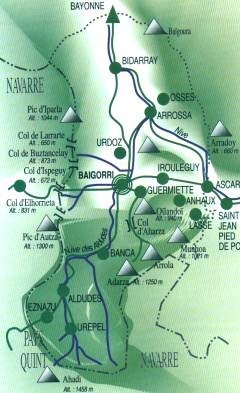 The most important is Adour River, that receives the water of most of the rivers of Lapurdi, Bidasoa, Errobi or Nive, Ugarana or Nivelle. Today, the most important income for the province is the comercial activity and tourism, specially in the cost. Fisthin has a big tradition in Lapurdi, specially in Ciboure nad Saint-Jean-de Luz, where the industry is concentrated. Ther is no so much industry development as in the spanish provinces, with the exception of the zone around Bayona. San Juan de Luz (Donibane), is the city, capital of the cantón, in the distric of Bayona, and is a very pret city and very web situated in the cantabric coast. It is the largest of the french pronvices, with 1336 sq.km. The limits are Nafarroa by the south, and southwest, and Zuberoa by the west; Lapurdi by the north and northwest, and Bearne by the northeast. The capital is Saint Palais. This regios is the one that limits with the Pyrenees by the south and maintains their rotos and rural traditions. Agricultural actitivy has a very important place in this province, open to the green tourism. The landscape comes from the higher mountouns, with Roncesvalles as the center path, descending to smaller hills and then low valles. The rives are Errobia (Nive), Arnegi, Aldude or Baigorri. This is a region with almost no industry, with big percentages of population that emigrates from the country to the urban centres, mainly due to the lack of attention from the French Administration. The economy is mainly rural. Agriculture and cattle raising have raised since last post-war. It is developed around the “caserío”. Low Navarra (Behenafarroa) is one of more interior regions of Euskal Herría and it maintins the euskalduna roots in a more intense way. One of the cities with bigger touristic movement, is San Juan Pie de Puerto (Donibane Garazi). It has sq. Km, and the limits are Bearn by the north and the east; Behenafarroa by the west, and the Pyrenees by the south. It holds the cantons of Mauleon and Tardets. This is the province all the way to the south and to the east, and is is called the Low Pyrenees. 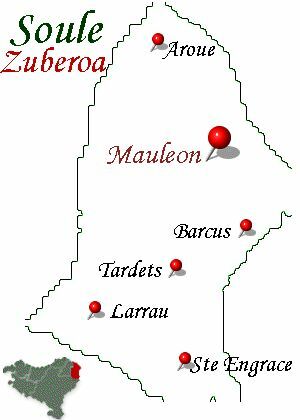 With the exception of the capital, Mauleon, the economic structure is very poor with a constant emigration. More than half of the population dedicates to cattle growth. All the area is full of plantations for the cattle. Soule gives the idea of being isolated and under their neighbour shade. This province is the secret garden of Basque Country. The mountains are bigger here. The industry is very scare and is around Mauleon. When investigating the genealogy of Itzaina, we should study Itçaina, and then we found birth notes of Dominique Itçaina, by 1704, daughter of Joannes Itçaina and Marie Garacotche, and also the birth of Martin Itçaina in 1779, with no knowledge of their parents. This two cases were registered in Saint Etienne de Baigorry, place where the born in Les Aldudes were registered. We finally got to know that three children, whose parents were Jean Itzaina and Catherine Arrambide, all of them born in LES ALDUDES, emigrated from France. Two of them (Jean Baptiste and Catalina) went to the United States. The third one (Miguel Graciano) emigrated to Uruguay, in South America. 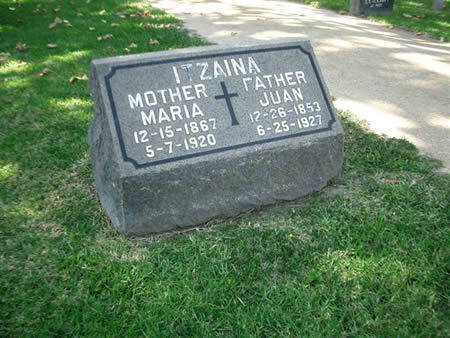 Jean Baptiste Itzaina, known as JUAN Itzaina, married María Etchevery, and they formed their family in California where they died. 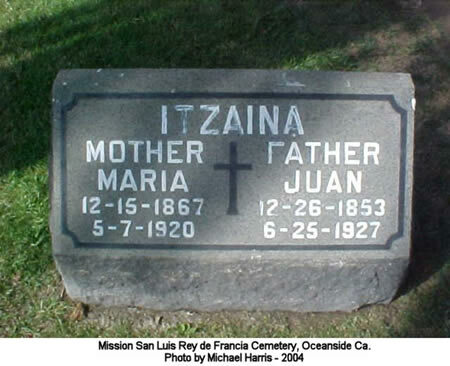 They are buried together in the Mission San Luis Rey de Francia Cementery, in Oceanside, San Diego County, California, as it is shown in the picture.